Around here, we’ve been getting organized for my daughter’s birthday party. Her party is tonight and it’s a sleepover! So we’ve been busy tying up loose ends and putting the finishing touches on the plans and preparations. In the past for my kids’ parties, I’ve used a party planning spreadsheet that I put together years ago. But this year, Jennifer and I collaborated on putting together a printable birthday party checklist, with a few more details included. Fun and oh-so helpful to have all the plans in one spot. The form includes a place to track who is invited to the party, parent contact info, and a gift log. The parent contact info is really helpful if you’re going to be at a venue away from home or if kids are spending the night at your home. It’s also helpful if your child is inviting new friends to the party and you don’t already have their parent’s info. The gift log will make it simple to send thank you notes once the party is over. There’s also a task checklist, shopping list, and menu planner, as well as a planning time line and a birthday party schedule so you can plan activities and assign them to time slots. This last one helped ease my mind the most, because it helped me see if we had enough activities planned to keep the party-goers engaged and having fun. I hope this helps you simplify your future birthday parties! What tips do you have for organizing a fun birthday party, and keeping track of all the details? I’d love to hear your ideas…so I can tuck them away for next year’s birthday season. So glad to hear it Jessica! 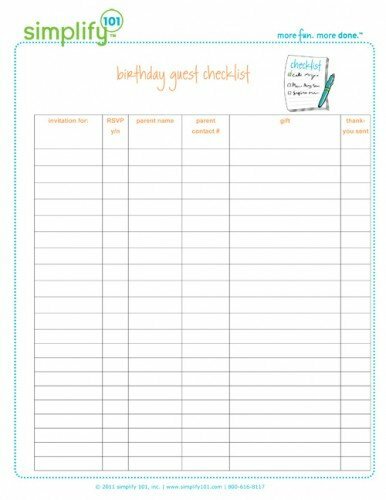 Thanks so much for this printable – the timing is perfect for our son’s party plans and it will be great to ‘start out’ organized!